(OPRAH.com) -- Huge, scary numbers are lurking everywhere these days: The massive federal bailout (now on the taxpayers' tab)...the unemployment rate, which is now at a 26-year high...that daunting sum you are constantly told you will need if you want to retire comfortably...the six-figure mortgage balance you barely chip away at each month. 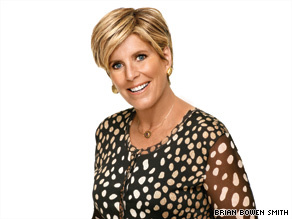 Financial expert Suze Orman says you can take baby steps to get yourself on path to financial security. Listen to me: Stop focusing on the big picture. Given what is going on in the world right now, you'll only fuel your fear and anxiety. Macroeconomics matter, but your security depends far more on microfinance --the small choices you make with your money. Every financial worry you want to banish and financial dream you want to achieve comes from taking tiny steps today that put you on a path toward your goals. I get so frustrated when people tell me it's unrealistic to create an eight-month emergency savings fund, or have money saved for a home down payment, or pay off their $5,000 credit card balance. I am not suggesting that you can snap your fingers and have everything taken care of. What I'm telling you is to move toward your goals in steps. Rather than get lost in the big picture -- "Eight months? Are you crazy, Suze? I can never do that!" -- focus on what is within your power: the sums you can sock away every week or month to get closer to what you're trying to achieve. Put $50 a week into a bank savings account earning 2 percent interest, and in three years you will have saved more than $8,000. Oprah.com: Money in the bank...how does it get there? Oprah.com: Is college worth the debt? 2. Have a little self-discipline! Okay, so where do you find the money to put toward your financial goals? If you're dealing with a layoff or furlough, I know you feel stretched to the limit. But often when families tell me they have no money for their goals, I look at their spending and find lots of "wants" to cut. So pull out your three most recent bank and credit card statements, circle every charge or debit that is not a necessity, and ask yourself, "Can I eliminate this cost entirely?" So many financial dreams are thwarted by the failure to act upon good intentions. Even if you commit to step 2 and free up money, using it wisely can be a challenge. Complete this sentence: I had every intention of ___________, but I got sidetracked or couldn't stick with my plan. That blank could be: (a) building an eight-month emergency fund; (b) investing in Roth IRA; (c) saving for a home down payment; (d) paying every bill on time; (e) all of the above. The solution is easy: Put your financial life on autopilot as a form of "forced" saving. Your 401(k) is a great example of auto-investing; with every paycheck, money goes into your retirement account. You can set up the same system at a discount brokerage or fund company to help you invest in an IRA, authorizing the firm to pull money out of your bank account weekly, monthly, or quarterly. Autopilot is also a great way to save for a home down payment. Have $100 automatically transferred from your checking account to a bank savings account each month and in five years at 2 percent interest you could have more than $6,300 set aside. An FHA-insured mortgage requires a 3.5 percent down payment, so $6,300 would be enough to buy a $180,000 home. In a 2008 survey of nearly a million 401(k) participants, the investment advisory firm Financial Engines found that 33 percent don't contribute enough to their company plan to collect the maximum employer matching contribution. That's literally turning down free money. The way a match works is that if you contribute to your retirement account, your employer will throw in some money, too. One common system is for an employer to give 50 cents for every dollar the employee contributes to her 401(k), up to a specified limit, such as 6 percent of a salary or a certain dollar amount per year. Under those terms, if the employee contributed $3,000, the employer would kick in another $1,500. Hello! That's a guaranteed 50 percent return on your investment. And $3,000 spread out over 26 pay periods is only $115 every two weeks. That's a small step toward a big goal. If your company doesn't provide a match -- or has opted to suspend its match during the recession -- you may still qualify for a Roth IRA. I recommend funding the IRA completely before you contribute to an unmatched 401(k). Without the match, a 401(k) is still a good deal, but a Roth IRA is even better. Details follow in the next small step. I know $5,000 or $6,000 is a big deal. And I promised small steps. So break that $5,000 into 12 monthly chunks. Does $416 sound more doable? If it's still too much, save what you can. No rule says it has to be $5,000. You can invest as little as $600 a year at some fund companies through an auto-investing plan, or save until you meet the $1,000 to $1,500 minimum initial investment most mutual funds require. Now we need to talk about asset allocation. For all your long-term investments, such as retirement accounts that you won't touch for at least ten years, you need a mix of stocks and bonds. Stocks offer the best shot at inflation-beating gains. But stocks don't always go up. That's where bonds come into play: They have less upside potential, but they also do not pack the same risk. So what's your Midas mix of stocks and bonds? Subtract your age from 100 and invest that percentage of your retirement savings in stocks. The rest belongs in bonds. For the stock portion, put 70 percent in U.S. stocks and the rest in international funds. As for the bonds: You should definitely have some lower-risk investments in your 401(k), but rather than invest in a bond fund, look for a GIC or Stable Value fund, which offers a guaranteed return. For your IRA accounts, I am all for owning individual bonds you can hold to maturity instead of bond funds, which are subject to trading and carry more risk. That's about what it would cost a healthy 40-year-old woman to buy a million-dollar 20-year level term life insurance policy; figure on less if you're younger and more if you're older. But the idea is this: A small amount of money buys your family protection if you die prematurely. You can shop for term policies at SelectQuote.com and AccuQuote.com. One of the most tragic disconnects I see is when someone tells me she loves her family to pieces but hasn't set up these four must-have documents: a revocable living trust, a will, a durable power of attorney for finances, and a durable power of attorney for healthcare. I realize these don't sound like a "small" undertaking, since estate lawyers may charge $2,500 to create them. If you're in your 50s and plan to live in your current home forever, try to pay off the mortgage before you stop working so you remove that big cost from your postretirement expenses. One way to do so is to make one extra mortgage payment a year. You can even spread the payment over 12 months.